i think i do ok in the area of tablescaping. but i know how much many of you enjoy it. 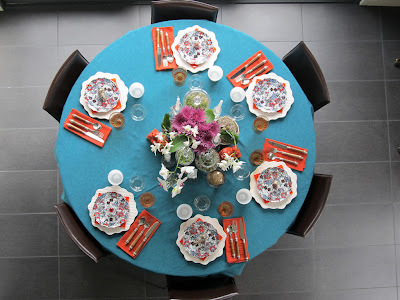 so i decided to ask a great twitter and blogger friend courtney from the blog living life out loud, to take one of my most recent pictures and design a budget tablescape around it. he did it. for under $10! 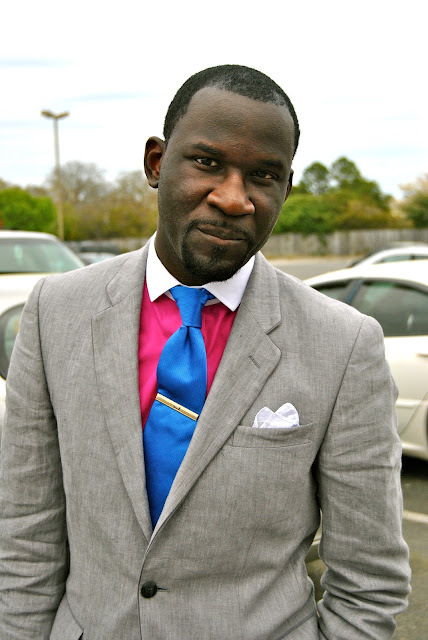 When Rashon asked me to do a guest post for the blog, I was a bit hesitant. While I have plenty to say, I am not always the most frugal person and one thing I know about Rashon is that he loves a good bargain. With some gentle prodding, I agreed to do a posting based around creating a budget table setting. So with my assignment in hand, I started brainstorming on how I could be true not only to myself but to Rashon and his audience of budget conscious décor mavens. 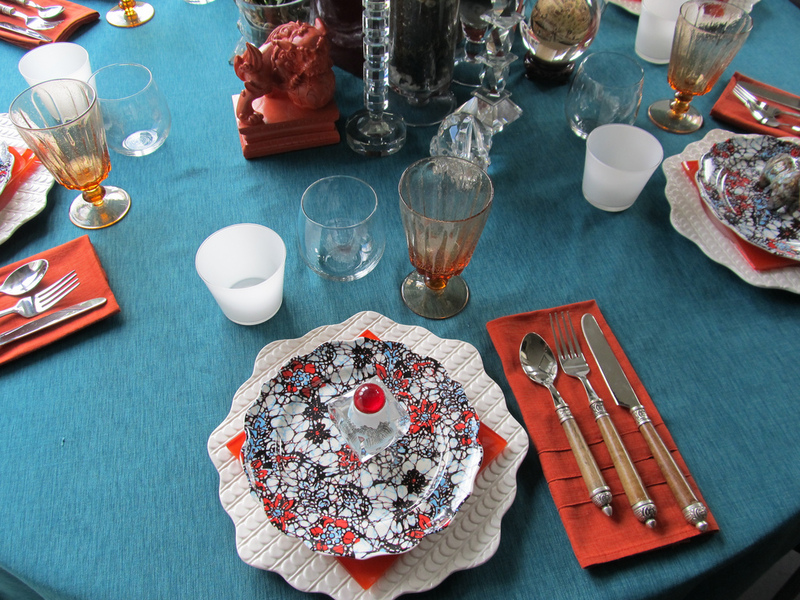 His shirt and tie combo reminded me of a tablescape I previously created to celebrate New Year’s (here). 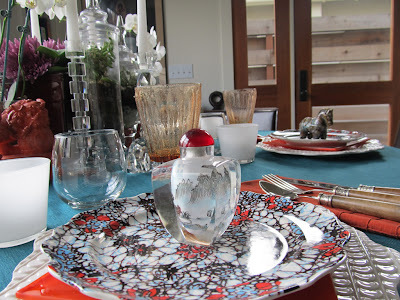 So thus the idea was born to shop my own home for ways to update an existing table setting. 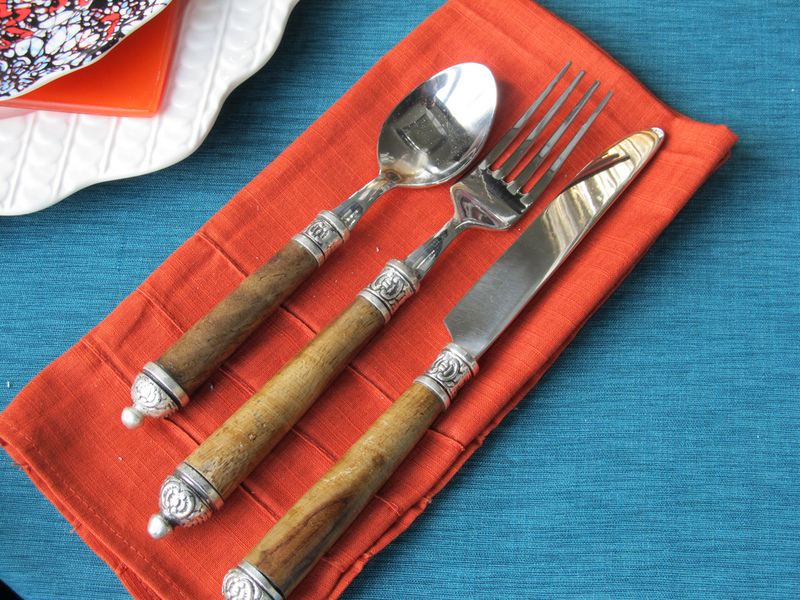 Most people have two sets of dishes lurking in their cupboards; a set for everyday use and a special occasion set. 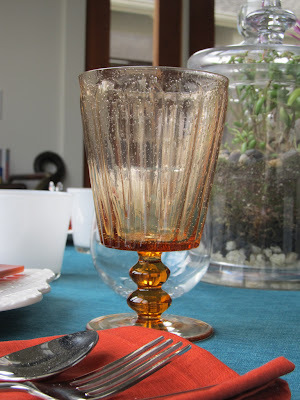 I am one of those abnormal few that have multiple sets of dishes and am always on the lookout for more. However, I will let you in on a few of my secrets. I only have three sets of dishes but a variety of salad plates and chargers. Simply switching out a charger or a salad plate can change the look of a table. Second, all my dishes are large and white, while my chargers and salad plates are bold and pattern-laden. I own two different types of large white round dinner plates and a set of square white plates. All of them are easily replaceable should they break. 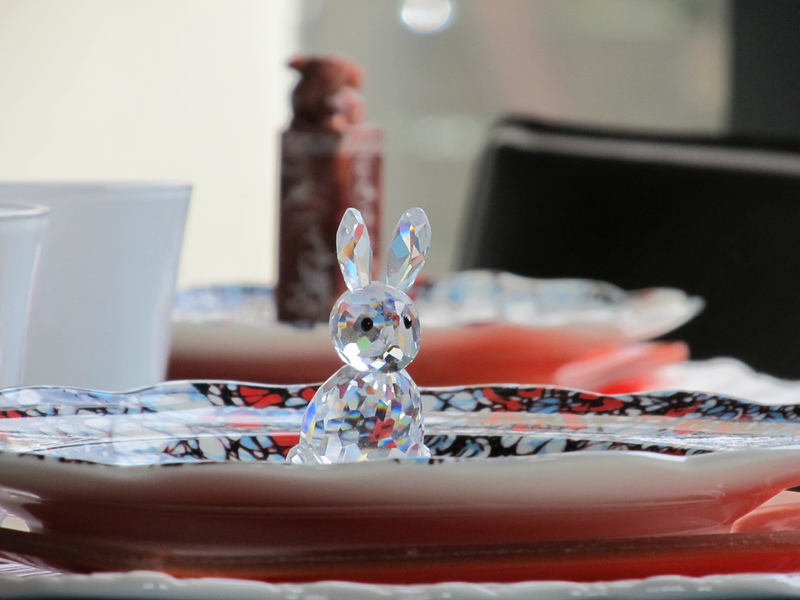 White plates also act as a great foil to boldly patterned salad plates or dramatic chargers, providing a visual “resting place” for the eye. Last, fun salad plates are a lot cheaper to purchase than dinner plates. On average, I do not spend more than $5 for a salad plate with most of my collection coming in around $3 a plate. When I tire of them, I bundle them up and either send them to a charity or gift them to appreciative friends. However, I didn’t follow my own advice in this scenario. 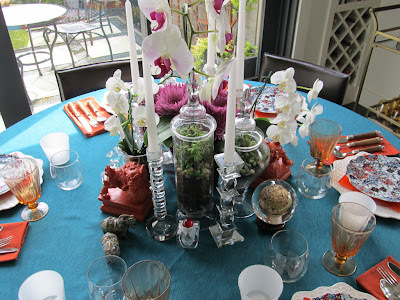 I really wanted to test myself and limited any changes to the tablescape to (1) glassware, (2) silverware and (3) the centerpiece. 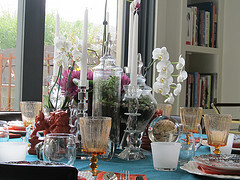 I took inspiration from my own home in the form of the orchids I have throughout my home. 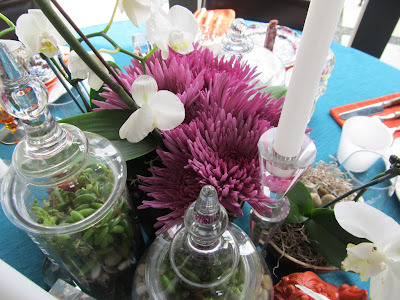 I thought that by grouping them, they would make a perfect no-cost centerpiece. 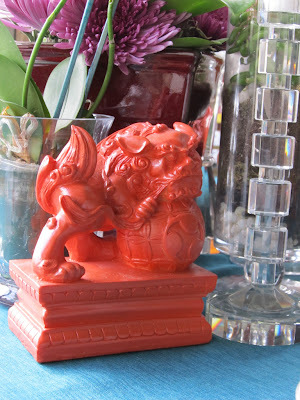 That initial thought directed me to create an Asian-inspired tablescape from objects founds in my own home. The only thing I bought were the mums I used to enhance the centerpiece. Otherwise, everything on the table is items I already had in my home. 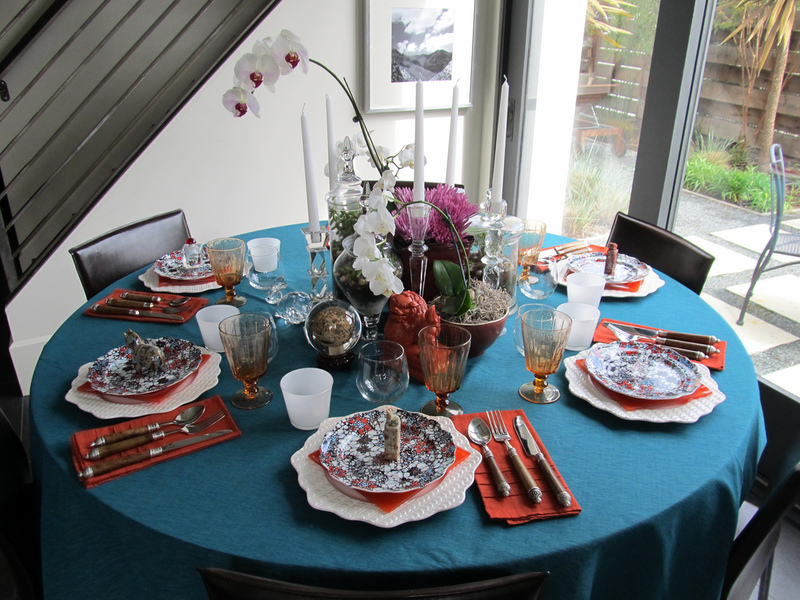 I think the final table setting while similar to the original is decidedly different. While not overt, the Asian influenced materials used to decorate the table create an unexpected twist and fun on the color scheme. What was once a statement table that I think many people would have been complacent with recycling is now reinvented in a new way, just in time for your Spring dinner parties.